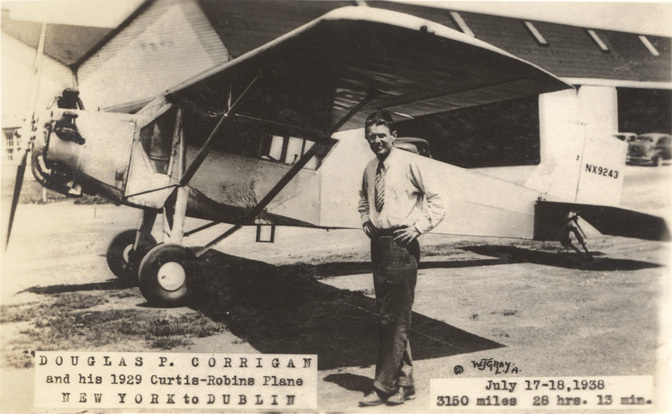 Aviator and mechanic Douglas Corrigan was one of the Ryan employees who helped build the Spirit of St. Louis. After Lindberghs famous flight, Corrigan decided he wanted to make his own solo flight across the Atlantic. After flying his modified 1929 Curtiss Robin monoplane to New York in 1938, he failed to get permission for a flight to Ireland. Instead, he was to return to California. The airport requested that not take off headed west. So he headed east, never turned around, and landed in Ireland 28 hours later. He claimed that his view was obscured by fog and that he had misread his compass. For that he was nicknamed Wrong Way Corrigan and became a folk hero.